Adopted on May 31, 1985. 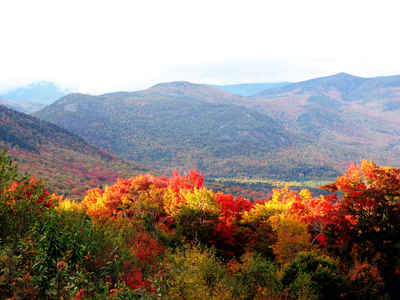 New Hampshire designated beryl as its official New Hampshire state mineral on May 31, 1985. Beryl is a gemstone commonly found in the granite rocks abundant in New Hampshire. 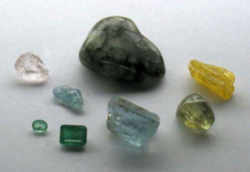 Beryl refers to a family of minerals that includes emerald (green), aquamarine (aquamarine blue), morganite (pink), heliodore (yellow-green), golden beryl (yellow) and goshenite (colorless). The word beryl is from the Greek word beryllos, which means "precious blue-green stone" and was originally applied to green gemstones. Beryl, when not used as a gemstone, is the major ore of beryllium, which greatly enhances the strength, and hardness of copper when alloyed together. Word brilliance is possibly derived from the ancient Greek word for beryl, berullos, which means crystal. Everyone admires the green fire of emerald and the aqua blue magnetism of aquamarine, but not many people realize that they are different colors of the same mineral - beryl. Other, much less known members of the beryl family are colorless beryl, or goshenite, which shows off the brilliance of this gem family, pink and peach morganite, heliodor, also known as golden beryl; rare red beryl, pale green beryl, which is a green version of aquamarine. 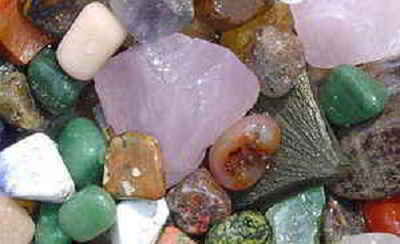 Beryl is often unknown to the general public, even the gemstone-buying public. 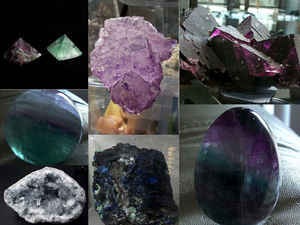 However, it is one of the most important gem minerals. 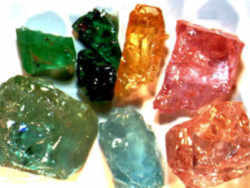 Beryl is colorless in pure form; it is the many different impurities that give beryl its varied coloration. Without these splendid color varieties, beryl would be a rather ordinary gemstone with only average fire and brilliance. 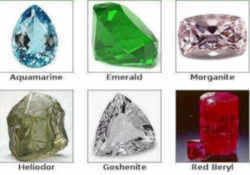 Emerald is the green variety and Aquamarine is the blue variety of beryl. Other colors of beryl are also used as gemstones but are not as well known. The greenish-yellow variety is called Heliodor. The pink variety is called Morganite. The colorless variety is called Goshenite. The name beryl is used for the red and golden varieties, which are simply called red beryl and golden beryl, respectively. Emerald is highly prized and is one of the most valued gemstones. Its green color is peerless and all other green gemstones are compared to its intensity. Emerald specimens are often "flawed" with mineral inclusions and fractures; unlike other gems, these are considered part of the stones' "character." These flaws actually help determine natural from synthetically-produced stones. Uncut emerald specimens are rare on the mineral markets, probably because even low grade emeralds can carry a high price when cut as gems. Especially hard to find are true "in-matrix" specimens. Fakes are often produced with natural crystals glued into a "host" rock and then sold as an in-matrix specimen with a highly inflated price. Aquamarine is also a popular gem although it does not command nearly as high a price as its green cousin. Uncut aquamarines are plentiful but relatively expensive, as would be expected of crystalline gemstone specimens. Large crystals of aquamarine are available on the open market and represent perhaps the largest raw gemstone specimens. In geology, beryl is a mineral composed of beryllium aluminium cyclosilicate with the chemical formula Be3Al2Si6O18 . The hexagonal crystals of beryl may be very small or range to several meters in size. Terminated crystals are relatively rare. The law designating the mineral beryl as the official New Hampshire state mineral is found in the New Hampshire Statutes, Title 1, Chapter 3, Section 3:14. CHAPTER 3 STATE EMBLEMS, FLAG, ETC. 3:14 State Mineral. 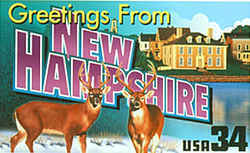 - Beryl is hereby designated as the official state mineral of New Hampshire. Source. 1985, 11:1, eff. May 31, 1985.